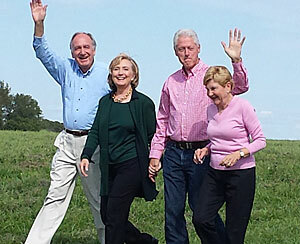 Tom Harkin, Hilliary Clinton, Bill Clinton, Ruth Harkin (R-L) at the Harkin Steak Fry in 2014. Photo by Debbie Noe. Hillary Clinton launched her 2016 presidential campaign by posting a video on-line this afternoon, promising to “hit the road” and inviting voters to join her on the journey. It’s billed as a “listening tour.” Clinton did very little of the talking in the campaign video released this afternoon. Instead, the video features people from around the country talking about their hopes and plans for the future. Sean Bagniewski of Des Moines and his wife, Vihdya, are in it. “You know, all the time you want a camera crew to come to your house and then your dog does that,” Bagniewski told Radio Iowa this afternoon, laughing. Bagniewski, 31, and his wife, who is 30, joke in the video that they’re hoping for the day their dog doesn’t try to eat the garbage. Julie Stauch of West Des Moines is also in the video, talking about the upcoming growing season for her tomato plants. Stauch has worked on a number of Iowa campaigns. Her last statewide race was Tom Vilsack’s 1998 campaign for governor and she plans to volunteer for Clinton’s 2016 Iowa Caucus effort. Bagniewski, a lawyer for the Iowa’s Medicaid program, met Bill Clinton when he was a fifth grader and has been a fan of both Clintons ever since. There were a total of eight prospective presidential candidates in Iowa this past week — six Republicans, plus two Democrats who say they may challenge Clinton for their party’s 2016 nomination. Lila Starr of Clive applauded and nodded her head in agreement with many of the points former Maryland Governor Martin O’Malley and former Virginia Governor Jim Webb made during their speeches at an event in Des Moines Friday night, but Starr backed Clinton eight years ago and she’s on board for 2016. Former Governor Tom Vilsack endorsed Clinton in 2007 after he ended his own bid for the White House. Now, Vilsack’s long-time aide, Matt Paul, is managing Clinton’s Iowa campaign. The connection between the Clinton and Vilsack families dates back to the 1970s. Vilsack’s late brother-in-law, Tom Bell, and Hillary Clinton were young lawyers who worked on the congressional committee that gathered evidence on the Watergate scandal. At this point in 2007, Clinton and handful of other Democratic presidential candidates were crisscrossing the state regularly to campaign for support in Iowa’s 2008 Caucauses. The lack of activity so far in 2015 has worried some Democratic Party activists, like Iowa Federation of Labor president Ken Sagar. The Iowa Federation of Labor is planning to host a candidate forum on August 6 in Altoona — at the state’s only unionized hotel complex — and Sagar hopes to have more than just one candidate there. “Politics in the United States is a pretty complex animal and the more people we get involved in trying to come up with solutions, the better off we are in my opinion,” Sagar said. Iowa Republicans held a news conference at the statehouse Saturday and the party’s state chairman vowed the GOP would “circle the wagons” around its nominee to defeat Clinton in 2016.